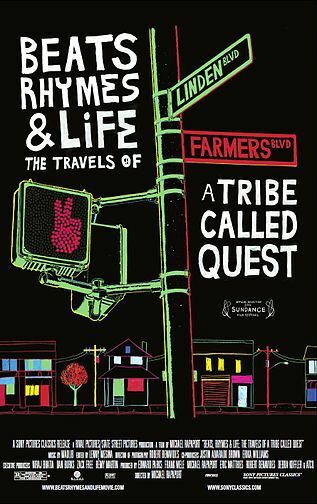 The documentary “Beats Rhymes & Life” follows the career trajectory of Hip Hop icons A Tribe Called Quest (Q-TIP, PHIFE DAWG, ALI SHAHEED MUHAMMAD & JAROBI WHITE). In the film, Director Michael Rapaport tells a story of how artistic talent, opportunity and success converged in a perfect storm whose aftermath ultimately led to the dismantling of the group in 1998. ATCQ reunited 10 years later but unresolved issues quickly surfaced leading the viewer question if members could ever settle their differences and continue to create ground breaking music. Rapaport set out to simply answer the question: “Will A Tribe Called Quest” create another album? During the process he quickly realized that the answer to that question is complicated. Every great group from the Supremes to the Beatles to the Police went through this kind of strife, however Beats Rhymes & Life successfully captures the emotional connection fans have with the music. It also taps into the birth of a strong artistic collective whose voice had been largely unheard amidst the controversial labels that had been heaped upon rap/hip hop in the 80’s and 90’s. In Pasadena Saturday Rapaport gave a Q&A following a screening of the film and it was clear that he told the story from the vantage point of a true fan. Not everyone was a fan of how the film turned out. According to Rapaport, Q Tip was not pleased, however the two are currently mending fences. I wasn’t sure if Tip’s feelings on the film were a function of HOW he was portrayed, or WHAT was said about him by other members of the group. You’ll need to see the film to answer that for yourself. Telling a story from the perspective of 4 completely different individuals was a huge challenge for the filmmakers, yet they manage to weave together a cohesive, insightful, engaging and entertaining tale. I should have started this post by saying that I NEVER go to the movies (maybe three times a year, tops). I’ve seen this film TWICE. For old school “heads” this is a fun trip down memory lane filled with laughs, drama, emotion and most importantly AMAZING music.